Rather than being rewarded for its actions  Ireland is being penalized. Its downturn has certainly been sharper than if the government had spent more to keep people working. 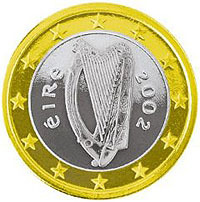 Lacking stimulus money, the Irish economy shrank 7.1 percent last year and remains in recession. Joblessness in this country of 4.5 million is above 13 percent, and the ranks of the long-term unemployed — those out of work for a year or more — have more than doubled, to 5.3 percent. ….Despite its strenuous efforts, Ireland has been thrust into the same ignominious category as Portugal, Italy, Greece and Spain. It now pays a hefty three percentage points more than Germany on its benchmark bonds, in part because investors fear that the austerity program, by retarding growth and so far failing to reduce borrowing, will make it harder for Dublin to pay its bills rather than easier. In the case of Ireland, it’s not clear if they had a lot of choice. They’re a eurozone country, so they couldn’t devalue their currency, and they’re running monster deficits even with the cutbacks they’ve made. Bigger deficits might simply not have been possible for a country their size. Still, the results are pretty obviously horrific, and any country that can avoid Ireland’s fate surely ought to. We certainly can, for example. So why do so many people want us to follow the Irish path instead?